10/3/2012. South Yorkshire Transport Museum. 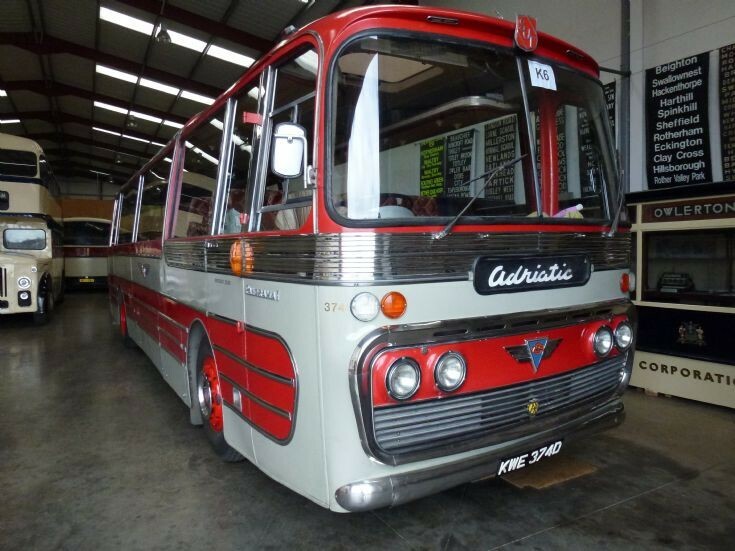 KWE 374D 1966 AEC Plaxton. Originally built May 1961 although it carries a 1966 plate. Original owner Sheffield United Tours fleet no. 322. I am involved in the restoration of this coach and, I think you may be getting a little confused John. KWE374D indeed is an AEC reliance but has an AEC 590 engine. It was made in May 1966 and its fleet number is 374. It originally had 41 seats. I believeyou are mistaking it with 1322 WA, also belonging to Sheffield United Tours and housed in the very same museum. Hope this clears things up. Added by Trev Weckert on 16 June 2012.